I am desperately trying to catch up with all the blog posts I have missed this month. Charlotte Carey gives a good summary of the Cultural Industries and Climate Change in the West Midlands event held by Culture WM. I wish I had been there, it sounds interesting. Some of what the speakers had to say was not new: that the West Midlands was the heart of the Industrial Revolution so it should become the heart of the green revolution is often said. I think, however, when you consider the massive investment ploughed into alternative energies in places such as Denmark or in Silicon Valley in the US, I suspect that goal might be a tough one. However, I was interested in the suggestion by Professor John Thornes that the region should develop “a season of events – cultural events highlighting issues of climate change”. I’m all for finding innovative ways to get the urgent and rather scary message about climate change out, without it terrorising people into apathy. This sounds an interesting approach, although I’m not sure exactly what form it might take. 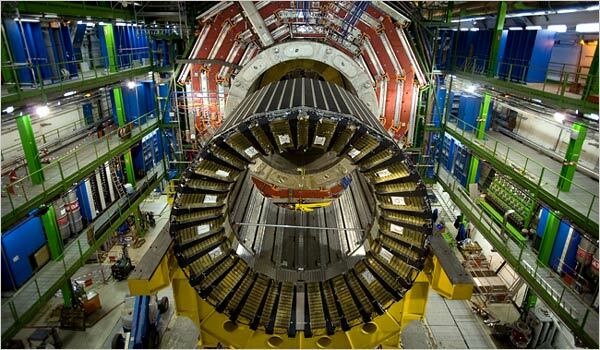 On Tuesday afternoon I fly out to Geneva to visit the Large Hadron Collider (LHC) at the European Organisation for Nuclear Research (CERN). This has come about because I wrote an article looking at some of the world-leading scentific research that was taking place at our universities in the city. It turned out the University of Birmingham was a team leader in the LHC project. So I’m off to walk around a tunnel that is over 26km long… and I can’t wait!! If you’ve got any questions for the team out there, let me know and I’ll ask them. If it’s a question related to physics, write it in the comments and I’ll print it off and hand it to them!